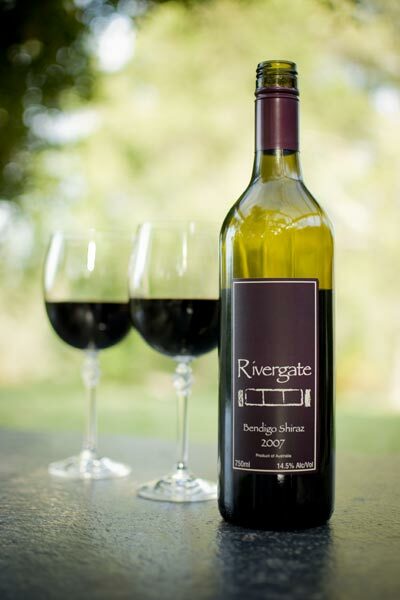 Rivergate Wines is a single variety vineyard, growing and producing quality Shiraz wines. It is located five minutes north of the Axedale township, midway between Bendigo and Heathcote. The grey-brown sandy loam over red clay soils provide an ideal base for growing Shiraz grapes. The climate allows for the full development of concentrated fruit flavours. Geoff and Ann Kerr own and operate this small vineyard and winery. Their aim is simply to create the best Shiraz wines – Serious Shiraz – Wines of Substance!! The grapes are grown on hand-tended, low yielding vines and are hand picked at their peak by family and friends. Production is limited to less than 700 cases per year to ensure ultimate quality. The wine is matured in new and old American and French oak barriques for 12 months at Rivergate cellars. When conditions permit a small amount of Reserve is made, which has an extra year of special oak treatment. The Shiraz wines produced at Rivergate are characteristic of the district, showing well developed dense fruit characters, with integrated tannins and balanced oak treatment and are a powerful example of handcrafted winemaking from a skilfully managed vineyard.